The New Year's Eve dinner is the most important dinner for the Chinese. Normally, this is the family reunion dinner, especially for those with family members away from home. In the New Year's Eve dinner, customarily, fish will be served. 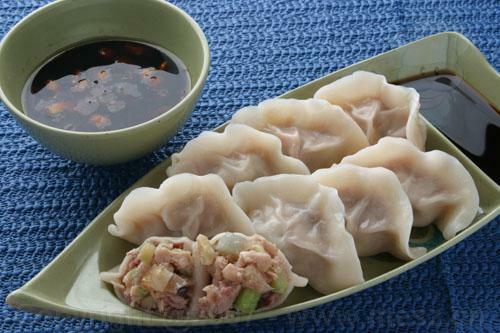 Dumplings are the most important dish in Northern China. These two dishes mean "prosperous." Other dishes are served depending on personal preference. The majority of the Chinese will gather together to eat New Year's Eve dinner at home instead of a restaurant. Dumplings are very popular in Northern China. It is one of the main dishes for New Year's Eve dinner. Conversely, very few people in Southern China serve dumplings in New Year's Eve dinner. It is solid cake made with glutinous rice flour together with some sugar. New Year Cake is popular in Eastern China. Tang Yuan is small ball made from glutinous rice flour. Glutinous rice flour is mixed with a small amount of water to form balls and is then cooked and served in boiling water. Tang Yuan can be either filled or unfilled. It is traditionally eaten during Yuan Xiao, or the Lantern Festival (the 15th of the first month of the traditional Chinese calendar). This is a mixture of rice, nuts, and beans cooked together. 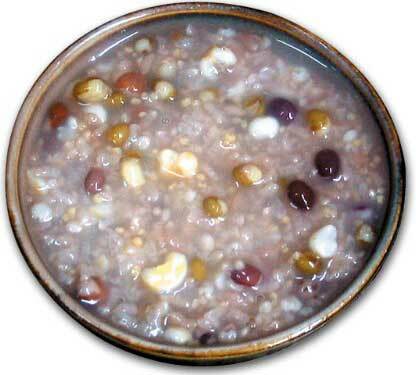 LaBa Congee is usually served at the LaBa festival, which is the 8th day of the last month of the year.